The SB401 comes in the most popular inch/ounce dimensions. 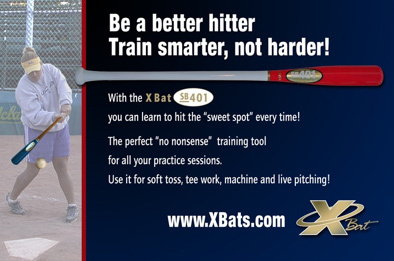 You simply train with the SB401 instead of your game bat. T work, soft toss, machine work, and live batting practice are where you swing the SB401. Please let common sense rule the day. If you are just learning how to hit, or teaching players how to hit, use the SB401 in controlled settings: T work, and modified front and side toss drills. As they master a sound fundamental swing, let them use the SB401 off of machine hitting and live batting practice. This won't be your ticket to stardom. This isn't a gadget or gimmick. Simple a tool to hold the player accountable whether you are in their presence or not!